Programs are a good way to extend the already extensive functionality of your Classpad. Visit Classpad Help Series and checkout videos 984 and 985 for help getting started with writing and running programs on your ClassPad. APII is used to solve and display any type of arithmetic sequence. Start either with the known first term and common difference or simply enter any two terms of the sequence. Solves for terms and sums of AP&apos;s backwards and forwards. GPII is used to solve and display any type of geometric sequence. Start either with the known first term and common ratio or simply enter any two terms of the sequence. Solves for terms and sums of GP&apos;s backwards and forwards and also sum to infinity. TimeSII uses moving averages, medians or deasonalising (using average percentage method) to smooth time series stored in list1 (time) and list2 (data) of the Statistics application. After the program has run, additional calculated data can be found in the lists 3 to 5. An option exists to make a prediction using the trend + seasonal component model. An update March 2017 adds another option to round indices and other values, either as they are calculated or after subsequent calculations are complete. savingII is used to solve savings problems - simply enter initial deposit, annual interest rate, amount of each regular deposit, how many deposits per year and how many rows you'd like - saving does the rest. 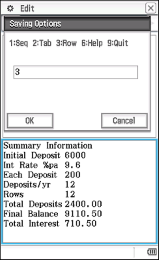 Options are (1) view the savings progress in the Sequence app, (2) view the savings progress as a table generated in the Stats app, and (3) calculate and view just one row of the savings scheme at a time. After the program has run, the table remains in Stats and Sequence is still set to generate the figures. zRootsII is used to find the exact roots of a complex number entered in either Cartesian or polar form. You may have noticed that ClassPad isn't the tidiest when it comes to solving complex equations, but this little program offers a host of display options to list all of the roots in exact form with zero hassle, including a graphical display. mavII (now superseded by TimeSII, above) uses moving averages to smooth time series stored in list1 (time) and list2 (data) of the Statistics application. After the program has run, moving averages are stored in list3, residuals in list4, seasonal components in list5 and seasonally adjusted data in list6. An option exists to make a prediction using the trend + seasonal component model. Also visit the Mini-Programs and Functions pages.